As we edge into definite winter in this part of the world, we need an arsenal of gear to make the season endurable. In today's windows, a few grace notes that make the indoors more cosseting and cozy. Winter woolens (and wool blends, and poly fleece) pill. You can use a sweater stone or comb, but there's a risk of tearing delicate cashmere or leaving bobbles behind if the stone is too finely gritted. Don't even think about the razor technique. The Gleener is the 'better mousetrap' de-fuzzing comb, for use on knitwear, upholstery, crafts. Three different heads (depending on the fabric) and a built-in lint brush—what more could a sweater-lover ask? Price, $US 20. I learned of the Gleener when I sat next to the mother of its inventor, Kim Cole, on a train between Toronto and Montréal. Now that is one proud woman, for a reason. 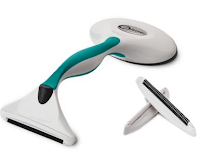 This gadget will be one of those things you never heard of and then can't live without. The Gleener site also sells a pet brush, various laundry accessories and a terrific collection of wet/dry bags. 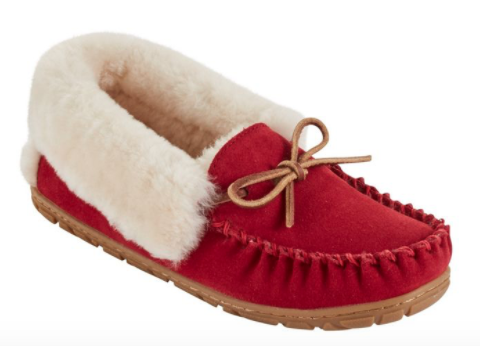 LL Bean's Wicked Good Moccasins: Our family staple for decades was named by The Wirecutter.com as their #1 pick for men and women. Now, the moccasin model comes in wide (D) width as well as regular. The composite sole is so durable some young adults have taken to wearing them as shoes. Red is especially cheery. They are warm, so check The Wirecutter for lighter and even vegan options for slippers. 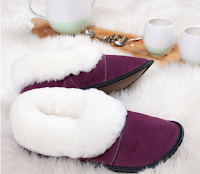 For hard-to-fit feet, check out the sheepskin slippers made by Shepherd's Flock in Townsend, Vermont, available in custom sizes based on a tracing you will send them. Be patient, as this is a small and personal business. Entirely designed and hand-made in Quebec, Garneau slippers are puffy, plush and made in delicious colours for men, women and kids—and they ship worldwide. I found their "Lazybones" model (shown) just touch less durable than Bean's (because of Bean's waterproof outsole) but now Garneau will add an EVA outsole for an extra $28. Price for basic Lazybones with leather sole is $CDN 110. Garneau also make a mule slipper, lighter weight so ideal for travel; the All-Purpose Mule is $CDN 85. Flannel is the northern woman's negligee, and while the effect is not La Perla, the warmth supports comfy lounging or sleep. Arlene Massey is a Gananoque, Ontario company who make flannel gowns, pyjamas and nightshirts in many colours and patterns in cotton, the real-deal thick flannel and lighter-weight flannelette; see website for prices, which vary based on fabric. They offer a wide range of sizes in the gown and pj (the nightshirt is OSFA), and accommodate requests such as extra-long arms. It's getting harder to find nice, thick flannel; Bean have flannel nightgowns but have cast their lot with plaids, which are not everyone's first choice. Early nightfall sends me searching for a novel long enough to last over a good chunk of the season, engrossing, with rich detail, wit and complexity. And here it is! 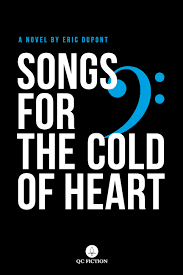 Eric Dupont's acclaimed "La Fiancée américane" has been translated into English (by Peter McCambridge) as "Songs for the Cold of Heart". An epic story of life in Quebec, it has earned Eric a Giller Prize shortlist nomination (Canada's most significant literary award). At 600 pages, plenty of satisfying evenings with these fascinating characters. Style? Saul Bellow meets Gabriel Garcia Marquez in Riviére-de-Loup. Dupont fans who read in French will be eager to read his new release, La Route du Lilas. 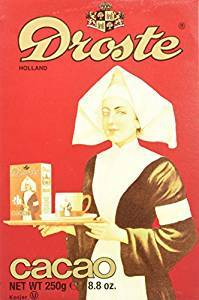 There are many fancy-schmantzy boutique chocolate brands out there, but the classic Droste cocoa delivers the unctuous mouth feel and deep flavour even when added to 2% milk—and the box itself is a charmer. Price, about $15 at a good grocery, or on Amazon. Note: Stash an extra so when you think, "Hot cocoa would be a good idea", a baker in the family has not mined your supply and there is but a forlorn teaspoon left. The baker can forget that cocoa is essential sustenance and that there must always be enough in the house for several mugs. The cocoa and the book, presented together, would make an indulgent, unusual gift. In winter, I've worn a pair of cashmere wrist warmers while at the computer, for at least five years. 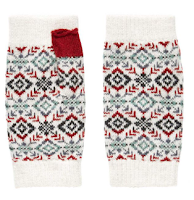 (Unlike cashmere gloves, they last practically forever.) If you work at a computer, read, or knit, you may notice your hands chill, especially if you don't like to blast a lot of heat into your house. Or what the hey, they just look great! Brora sometimes put them on sale, but if you want a pair right now, they are not the breath-catching price of their sweaters, so I say go ahead. You can buy long or short versions, in plain, stripes or patterns. This folk motif pair is on sale for £29. Nominations for your indoor winter musts are most welcome but don't try suggesting a plane ticket to Antigua. Laura Jantek: Absolutely, and a shawl can be essayed by a beginner knitter, if she stays away from complicated stitches. I have an Ivko wool shawl that is an absolute dream, and a suitcase full of fine wool ones from various places. (They are kept in a vintage but airtight leather suitcase to keep moths away.) Ravellry is a terrific site! I had to laugh, you managed to hit so many of my favourites - Shepherd's Flock (also wonderful earmuffs), Garneau, Arleen Massey, Brora wrist warmers. Your cocoa recommendation will be implemented asap! As for my suggestions, I stand with my fellow Laura - shawls and throws are the best! I have several from Silo Weavers http://www.siloweavers.ca/silosFS1.htm My house has a bit of a floor draft in certain spots so I use a lap blanket as well - perfect. A fireplace is also wonderful for winter if you are lucky enough to have one. If your considering a Reno, this might be a great add-on in our climate. LauraH: Did you discover any of those via PdesP, perchance? I see Silo Weavers' store is closed but there are usually some beautiful hand-woven shawls and scarves at the One of a Kind show. Fireplaces are a delight; the conventional wood-burning ones are now banned in Montreal. There are some new emission-reduced models that are OK but friends who have to old kind (and so many Mtl homes do) are forlorn. When I lived in Toronto I enjoyed both a wood-burning fireplace very much. I like gas fires too but they are not the same. Lily: Candles! Yes, we are still allowed to burn those. I am almost eager for an ice storm to test my new Icebug boots. Winter boots! Now that would a great post. LauraH: Thanks for the idea. It would be a short post because for over 25 years, I have worn winter model Blundstones. I also have a pair of Icebug boots for the glare ice conditions we can get. But Blunnies are my boys. I, too, love candles now that the nights are drawing in fast. I have three very large candle lanterns that sit inside my fireplace (I don't need an actual fire or stove in my centrally - heated city house) and I burn a variety of church pillar candles in them. The candles don't smoke when burned in a lantern, and it also means there is zero chance of anything catching fire. I have a mirror standing behind them in the fireplace, which doubles the effect of the light. They look so lovely, and provide enough light by themselves for watching TV, reading a Kindle or listening to the radio. For cosy winter feet I go for Mahabis, which are warm and come in a range of sole options (half sizes, too). The style also allows you to pop arch supports into them, for comfortable all-day wearing. I couldn't live without arch supports - I even wear them in my wellies, and have happy feet!